This album is the equivalent of a powder keg, fans and catty industrial boys. There isn't anything to speculate over about this new album from Claus Larsen. Did you like 'The Re-Birth of Agony' and '1-9-8-2'? You'll wolf this one down without a second thought then. He's seen the paths those ones laid out to fruition, an odd trifecta yes but you don't want to miss out on this for the world. 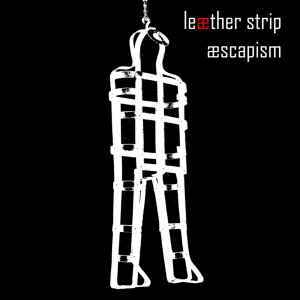 Leaether Strip are without doubt the strangest act out there in the world of EBM. It is the lyrical content which will bring you back to Larsen's newest. Repeatedly. I only got this thing last week and I've been playing it pretty much continuously. How's it that when someone lowers their profile that the work becomes so much more powerful? Because this one did. Between 2005 and 2010 he was on a label which made sure you constantly knew precisely what he was up to; I suspect this was one of the many reasons he left in 2011. The man likes his privacy, alright? Who can begrudge him that; just ask anyone stupid enough to wander into his garden at night. In the last few years, Claus has begun to focus in more on his fan base, releasing limited runs of his earliest songs, special EPs, and having the audacity to press things on vinyl (which a lot of bands used to do... especially those who played Dorian Grey). He plays live now almost as much as he did in the highly regarded Zoth Ommog days, unlike then he gets to keep his share of the money he makes from his work. I'm certain this isn't lost on him, if anyone has had to deal continually with the short end of the stick in the music business it'd be this guy. I interviewed him back when he re-surfaced the first time and he didn't seem to have many kind words for those he'd dealt with in the past, and why the hell should he. Some labels moldering along out there have made a themselves into a cottage industry by issuing his works without his consent. I have to confess that after 'Aengelmaker' I was starting to get burnt out. Multiple releases per year and a relentless marketing blitzkrieg from his label at the time. There was just so damn much of it! Things seemed to be spiraling out of control and then he pulled the plug. Again. Only this time he didn't disappear, he pulled back and began to release material which I happen to think is some of the best he's yet done. His voice has deepened with time, there's a lot more confidence in how he sings on this album. It's intensely personal, colorful, twisted, sad and yet somehow stunningly resilient on 'Aescapsim'. These are the songs of a grizzled veteran in the dark electro scene who knows exactly where his strengths lie. He's really put a lot of effort and care into this and it shows. Nothing drags on, nothing is excessive. There is a perfect balance of atmosphere, aggression and agony which makes up 'Aescapism'... the kind of concoction you're advised to drink in slowly. One delectable sip at a time, swirl it around and let your senses be saturated. Leaether Strip in 2014 write melodies that'd make even the most dismissive listeners pause to reflect on. He's got some things to say about where he's been and where he's going. Some of these pieces are so minimal that I'm amazed he let them out, they don't have much of anything to ground them except his voice. A voice that intones a lot of loss and despair but does so in such an eloquent way that you're all too happy to sing along. Yeah, that's right, there's a lot of singing on here. "The Hired Man" is probably one of the prettiest songs he's ever done and it really is incredible how he builds it up and then lets out the emotions in a torrent of synthesized beauty. "Strong Boys" is, by contrast, downright hilarious. A night out with Larsen must be memorable. He deftly rants about some interpersonal drama and then places just the hook from 'Behind The Wheel' in there while he talks about it. Rummelsnuff's even on this tune, it's pure muscle. No fat to trim here.